People should not put apostrophe’s in places where people should not put apostrophe’s. Mr. Scatter has been seeing much too much of this nonsense of late. In Birmingham, England, it turns out, they’ve been long time passing: According to an Associated Press report via the Seattle Post-Intelligencer, city bureaucrats have been dropping the little floating comma from Birmingham’s street signs since the 1950s. So it’s no longer “St. Paul’s Square”; it’s “St. Pauls Square.” And, as some critics are sniffing, it’s no longer the Queen’s English, it’s the Queens English (which sounds, if you think about it, like the argot of a particular borough of New York City). Here at Art Scatter we like to think of punctuation as little road signs along the great linguistic superhighway, helpful warnings that a curve is coming in the road and you need to slow down, or a thought has run its course and you need to stop. Pay attention to the road signs and the meaning comes clear, not to mention the rhythm that is playing in the author’s head, and which presumably she or he would love to plant in your own intellectual pulse. More poetically (and less argumentatively), the use of punctuation is a handy writers’ tool in the construction of mood and suggestion: “He’s driving fast fast fast” is simply faster to a reader’s eye than “He’s driving fast, fast, fast” — and if the blur of speed is what you’re trying to get across, using commas is like driving in the Indianapolis 500 with your emergency brake on. Here in The Great Republick That Our Forefathers Built (or is it Forefather’s?) we seem to welcome all those apostrophes banished from Birmingham: As the photo at the top of this post illustrates, we like to throw them into words willy-nilly, like candy confetti on top of a cupcake. 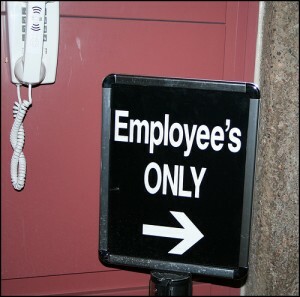 For an amusing exploration of the subject, see The Care and Feeding of Apostrophes. Nor is the comma the only mistress of Americans’ punctuational promiscuity. Over at Blogorrhea, the courtly Mr. Mead Hunter has introduced us to the perverse pleasures of The “Blog” of “Unnecessary” Quotation Marks, a photographic compilation of signage screwups that are, as the MasterCard commercials say, priceless. And Art Scatter itself confesses to a fondness for the colon that verges on the indiscreet: Like a politician with a wayward passion for that little taste of danger, we let ourselves be seen in public with the slatternly Ms. Colon on our arm far too frequently. What to do, then, when, punctuationally speaking, we’re not sure what to do? Americans are a practical people (as a nation we are Rome, not Greece; engineers, not artists) and the obvious answer is: avoidance. Just don’t let it be an issue. Around Portland, that means eliminating the historical struggle between Sauvie’s Island and Sauvies Island by settling, at least officially, on Sauvie Island. 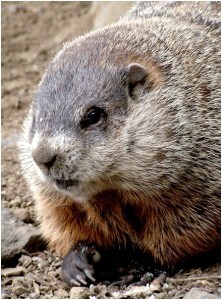 Nationally, let it be noted that tomorrow morning, when Punxsatawney Phil pokes his head out of his burrow and sniffs around for signs of spring, he will not be marking Groundhog’s Day or Groundhogs Day. It’ll be a singular event: Groundhog Day. And if he casts his shadow just right, maybe we can avoid misplaced apostrophes for six more weeks.